This section contains detailed information relating different aspects of the foreign exchange market. Here you can find the latest articles, success stories of the famous economists and traders. The section also consists of various Forex strategies based on the different factors. There is also our electronic library of the unique materials on Forex trading that available for your use. The third day opens inside the second black candle, then prices come down in the first candle. As a result, if the Two Crows consists only of one candle, we have the Dark Cloud Cover pattern. As the gap rapidly fills up, we can not definitely predict continuation of trend. How to determine the Two Сrows? 1. A long white candle continues the trend. 2. There is a gap up on the second day. The second candle is black. 3. The third candle is also black. 4. The third day starts inside the second candle and closes inside the first candle. The market grows for a long time. Gap up, which is followed by the lower close price of the second day, indicates deceleration in growth. The third day opens higher, but not as high as on the previous day. Then the price goes down. 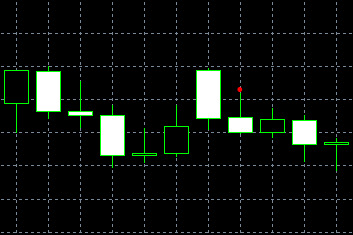 The trading closes deep inside the first candle. Therefore, the gap fills after the second day. Bullish trend leaves the market. The Two Crows pattern is characterized by a more pronounced bearish mood in comparison with the Upside Gap Two Crows. On the third day, the long black candle is always closes inside the first candle. The longer the black day and the lower the close price, the more pronounced the bearish trend will be. The Two Crows pattern could develop into the Shooting Star, which is consistent with its bearish behavior. This pattern is similar to the Dark Cloud Cover pattern, as they indicate building of a short-term point. If we combine the second and the third day into one candle, it will turn into the Dark Cloud Cover pattern. The difference between the Two Crows and the Upside Gap Two Crows is that the third day does not close inside the body of the first day. Besides, the Two Crows can slightly remind the Evening Star, with the difference that there is no gap between the second and the third candles.